We are introducing an update of this template that is compatible with the latest version of Joomla - 3.8+. We are happy to say that it is a fully responsive template. Templates that are responsive have a beautiful design on any device you might view it from, be it - smartphones, tablets or PCs. As the world of technology develops so fast, there is no place for websites that are not responsive today. Kindergarten Joomla theme can be useful for people or startup companies who have kindergartens, kids studio, preschool, child care organizations or anything related to this field. 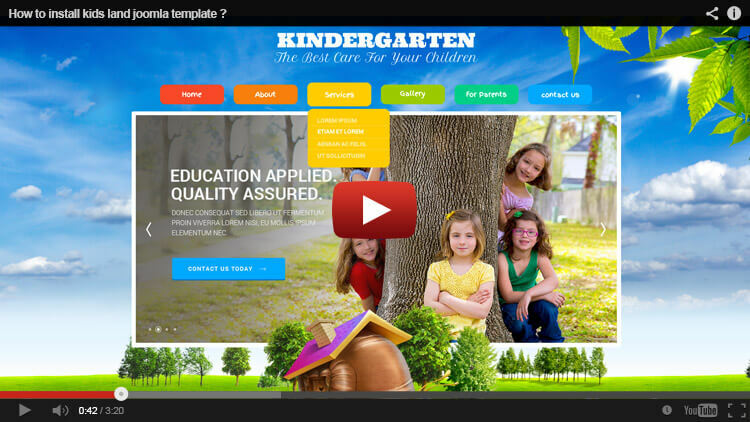 The template includes all of the pages that you might need when having a kindergarten website. To discuss in more details it includes Home, About Us, Services, Gallery, For Parents and Contacts Us pages. The most important one from here is Gallery page, as it holds information about how your kindergarten looks. You have the ability to upload unlimited photos here, along with captions to be more informative if you wish. The template is very easy to customize, as it is a CMS template. CMS is the same as the Content Management System. Themes that fall into this category do not require any kind of knowledge or experience in order to be able to edit the template. The reason is that you can control your full site/content with Control Panel. All of the images that you see on the preview of kindergarten Joomla template are included in the package and can be used on the website legally. However, please do not use it on any other websites. If you host your website on www.m9host.com installation fee will be free for all customers. 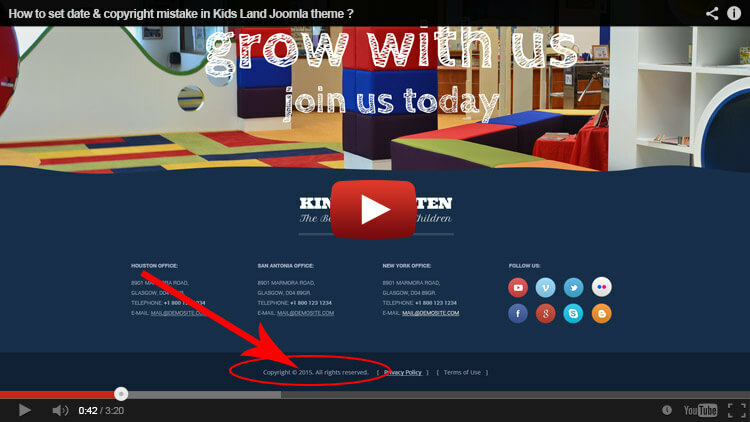 HOW TO INSTALL KIDS LAND JOOMLA TEMPLATE ? 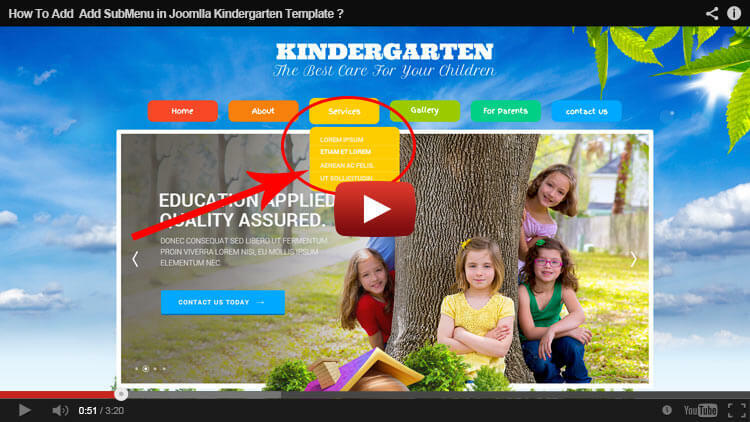 HOW TO ADD SUBMENU IN JOOMLa KINDERGARTEN THEME? HOW TO SET DATE & COPYRIGHT MISTAKE IN THE FOOTER ? HOW TO UPLOAD IMAGE IN THE GALLERY ? Hi Is this theme support RTL? regarding other errors: if you want see on https correctly you should install your template again on https url address. You have installed template on http and then added SSL why you have problem with it. How do you rename a gallery category? you should delete cache in your browser, it works fine you see old info. please delete cache in your mobile browser and try to see again. You are not first who has this issue and all our customers solved it with this script.